floating. – animal crackers on the couch. I read that quote and thought it was very fitting to parenthood. at least motherhood. most days I ache for bedtime. but I also spend a good portion of my days taking mental snapshots. memories. trying to squeeze permanence from every laugh, every smile, every moment. it’s odd living and desiring two opposite things: for them to just GO TO BED. and for them to NEVER GO AWAY. maybe that’s why mothers are so scattered. our brains and hearts are constantly at odds. summer is here. hopefully to stay. we got a BIG plastic swimming pool, big enough for Matt to stretch out in. I plan on spending our down time in swimsuits and doing a lot of nothing. nothing but memory making. We are going to soak up the sun, the summer, the hours, the days, each other. The years are short. Lincoln will be four in the fall, and Stella three. Preschool will soon morph into Kindergarten, Kindergarten into college. This might very well be our last summer of no plans, no activities, no obligations but to just float. Float and giggle. We are gardening, eating fresh raw veggies in abundance. We are in love with wheatgrass and kale smoothies. Life is very simple right now. I feel like we are in the calm amid the storm. Baby bootcamp is over. Life of school chaos has yet to hit us. we are floating in that sweet spot of childhood. Lord let it last. I know it will be Christmas in the blink of an eye. but, until the leaves turn and fall, we will be floating. all five of us, in a store bought plastic swimming pool. 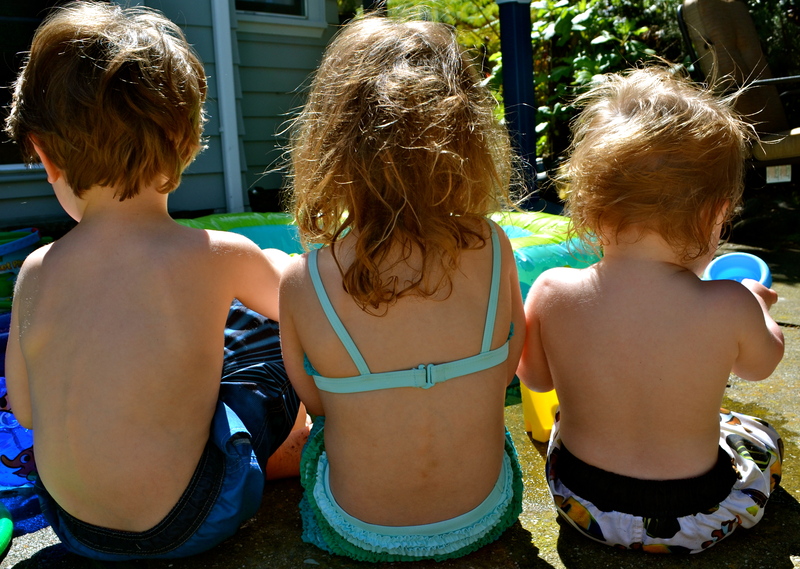 Posted on April 22, 2012 by stibbsfamily	This entry was posted in daily life, thoughts and tagged child hood, Home and Garden, lazy summer, plastic swimming pool, summer plans, Swimming pool. Bookmark the permalink. there is a reason you are one my all time favorite people. you have a magical way of saying everything i ever wanted to say in such a lovely way. i miss you. i hope i move to california. Poetic writing. Great post. Just stumbled here. I’ll be back.